Have you ever heard of nasturtiums blooming in England six days before Christmas? Well you have now. These still cling, erect, to the trellis attached to the garage door. 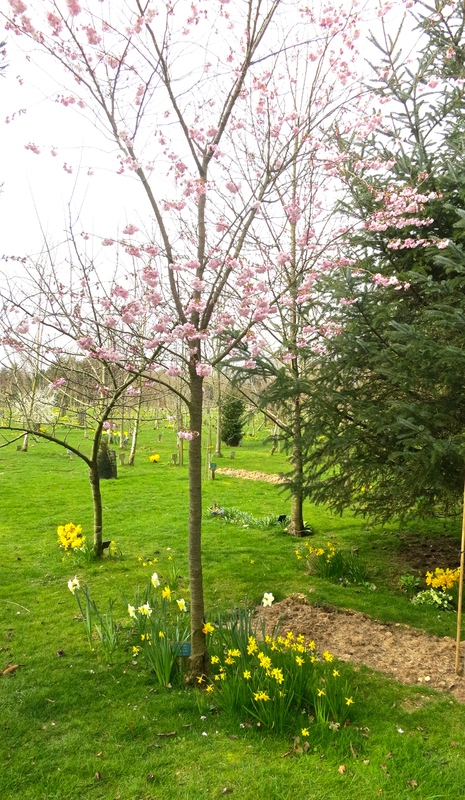 The purpose of Walkford Woodland Burial Ground is to provide plots for interment and for ashes which will eventually return to their natural state. Approved trees may be planted among the graves, with clusters of flowers around the cremated ashes. These flora must be those found indigenous to this country. Today I accompanied Jackie, Helen, and Shelley for their annual placing of a wreath on their mother’s plot. Afterwards Shelley produced a splendid meal for us all, including other husbands, Ron and Bill. We were treated to a succulent chicken and artichoke heart casserole; creamy mashed potato; and flavoursome carrots and Brussels sprouts. This was followed by home-grown raspberry and blackberry crumble with cream or custard. I, of course, chose custard. Red and white wines were on offer, after mulled wine. When we returned home no further sustenance was required. This morning we wandered around the garden investigating signs of Spring regrowth. We have snowdrops, hellebores and crocuses coming into bloom. The still small daphne odorata is keeping its powder dry until the temperature is warm enough for its burgeoning buds to burst open. 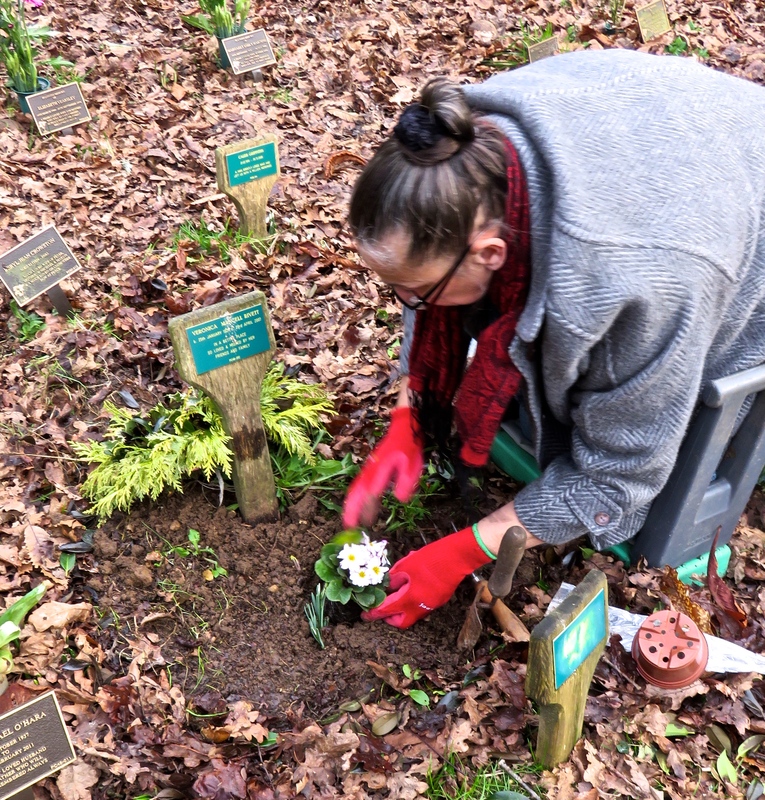 From these signs of burgeoning life we visited the Woodland Burial Ground at Walkford so that, on what would have been her mother’s birthday, she could add to the planting around her burial plot. Pleased to see her earlier snowdrops coming through, she added more and a further primula. The idea of this scheme is that human remains be allowed to rest in communion with natural woodland. There are no gravestones. Some bodies are buried; others’ ashes are interred. Each has a little marker. The soil around the plots settles naturally back into the earth. Only native woodland flowers are permitted to be planted on the sites, although it is clear that many people do stretch a point. 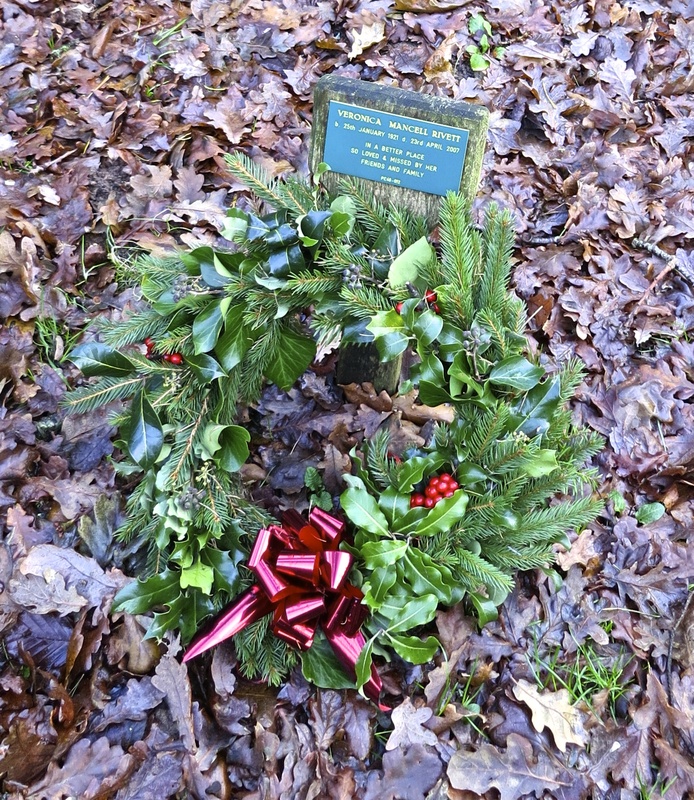 Wreaths, such as that which we set in place in December, must be removed by the end of this month. Jackie took it away today. Two gardeners were busy tidying up after yesterday’s gales. In speaking to one, I observed that there was much to do after the storm. He agreed, adding that what was worst was the rain, bringing a great deal of mud and heavy soil that was difficult to work, especially in the digging of graves. I described his workplace as a haven of peace. A diversion on our return home took us past Shelly and Ron’s home. Naturally we called for a pleasant chat, coffee, and, in my case, a slice of delicious Christmas cake. This evening we dined on Jackie’s savoury rice served with Thai style prawn fishcakes, peas, and green beans. Today we visited Shelly and Ron’s at Walkford for an excellent lunch and an afternoon spent in convivial company and reminiscence. The other guests were Helen and Bill. Before lunch I joined the three sisters in laying the annual wreath on their mother’s plot in Walkford Woodland Burial Ground. This was a pleasant visit. 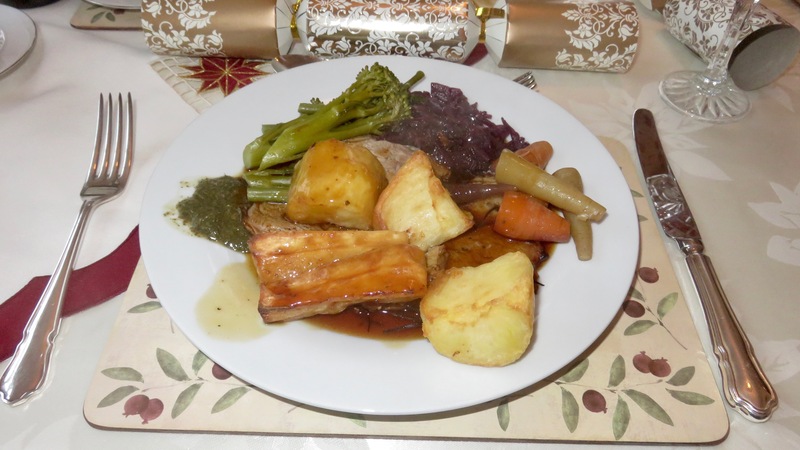 Back at Shelly and Ron’s home we drank mulled wine and consumed nibbles followed by a meal of tender roast lamb served with roast potatoes and parsnips; red cabbage, broccoli, green beans, and multicoloured carrots. Red and white wines were drunk. 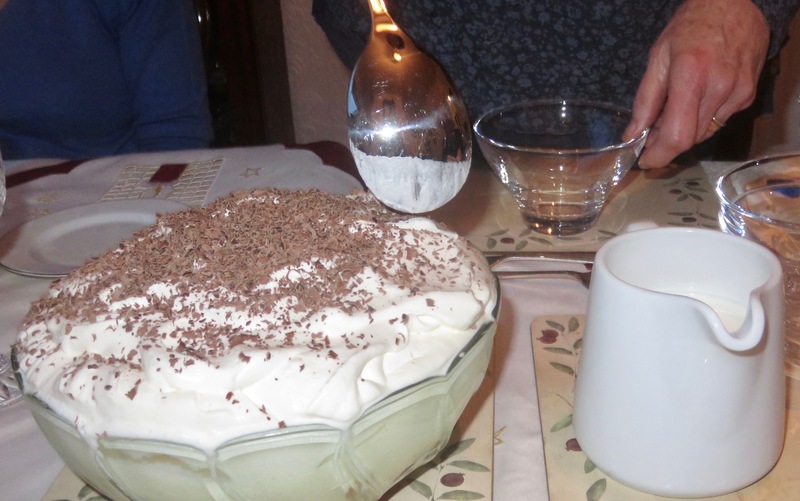 This was followed by a splendid trifle enhanced by the sharpness of cranberries. Plentiful cheese and biscuits, coffee and after eight mints completed the meal, even though, as Helen pointed out, it wasn’t quite five o’clock. Conversation continued into the evening. On our way to Walkford we diverted for a short drive through the moors around Wootton. 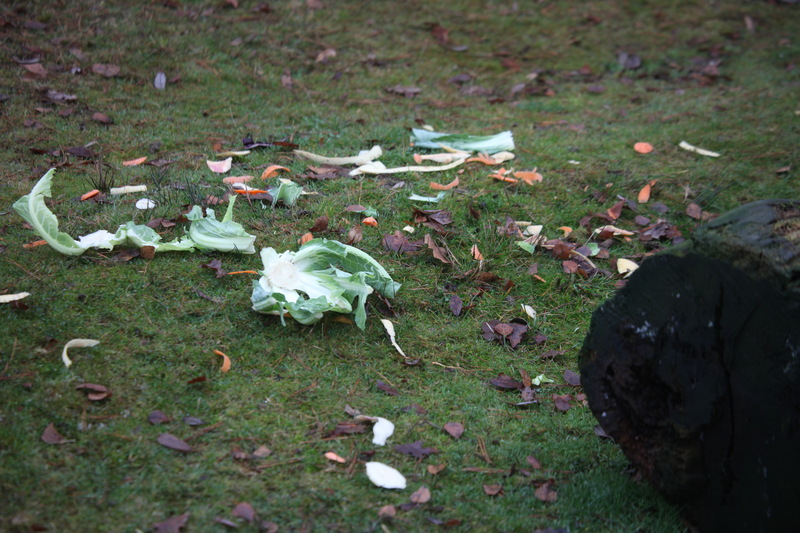 I decided that a sprinkling of vegetable peelings in the forest was unlikely to be someone starting a compost heap, but rather food some kindly individual had laid out for the absent ponies. These creatures were keeping a low profile. but greater distance led to obscurity. Naturally we needed no more sustenance when we arrived home. Over coffee, Jackie and I began the day discussing the detail of the Churchill queue photographs posted yesterday. Even I, who had been there in January 1965, was surprised at what can be revealed by clicking on the images to enlarge them. This prompted me to add a postscript that you may find as fascinating as we found the exercise. Little did I know, when I pressed that shutter, that it would one day be possible to send those pictures and comments on them, for immediate consumption, across the world at the touch of another button. Afterwards, I extended my gentle amble to the entrance to Roger’s fields. Primulas are now blooming on the verges of Downton Lane, and, on this more overcast day, yesterday’s vibrant tree bark colours have made way for gentle sage greens and silvery greys. 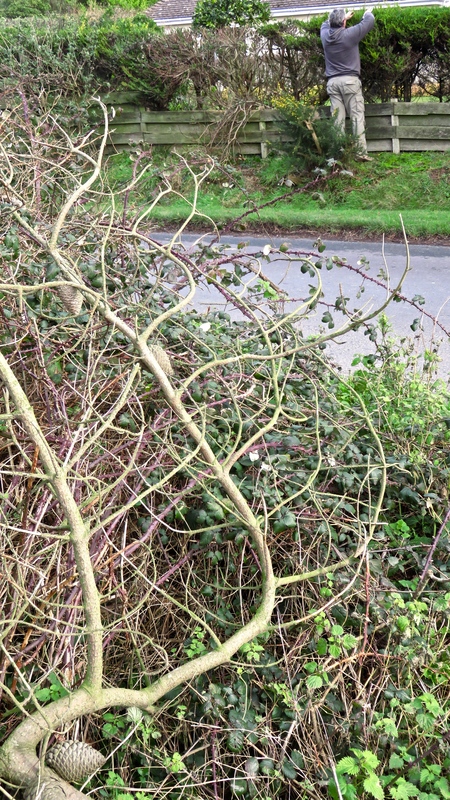 First chatting to Carl in the pub car park, I engaged in a longer conversation with Paul, a very friendly builder living at number 25, who was clipping his hedge. He noticed me photographing a pine branch that had been ripped off and thrown across the other side of the road. He told me it was very unusual for these limbs to be torn from the trees, and that even now it would be very difficult to break off the cones. After lunch, as today would have been Jackie’s mother’s birthday, we drove to Everton Nurseries where we bought primulas and snowdrops which Jackie planted by her Mum’s plot in Walkford Woodland Burial Ground. Only natural woodland flowers are to be set there. 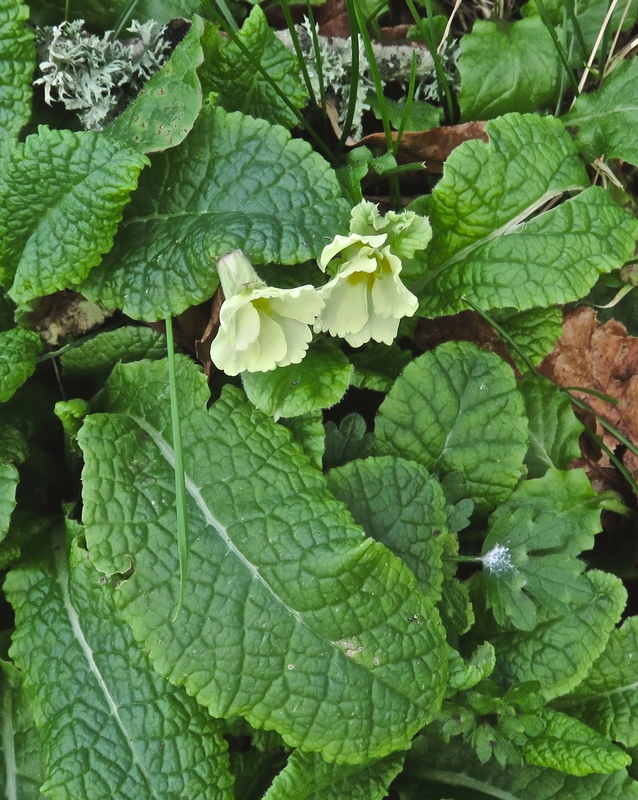 Although the primulas are cultivated, they will, if they survive, soon revert. 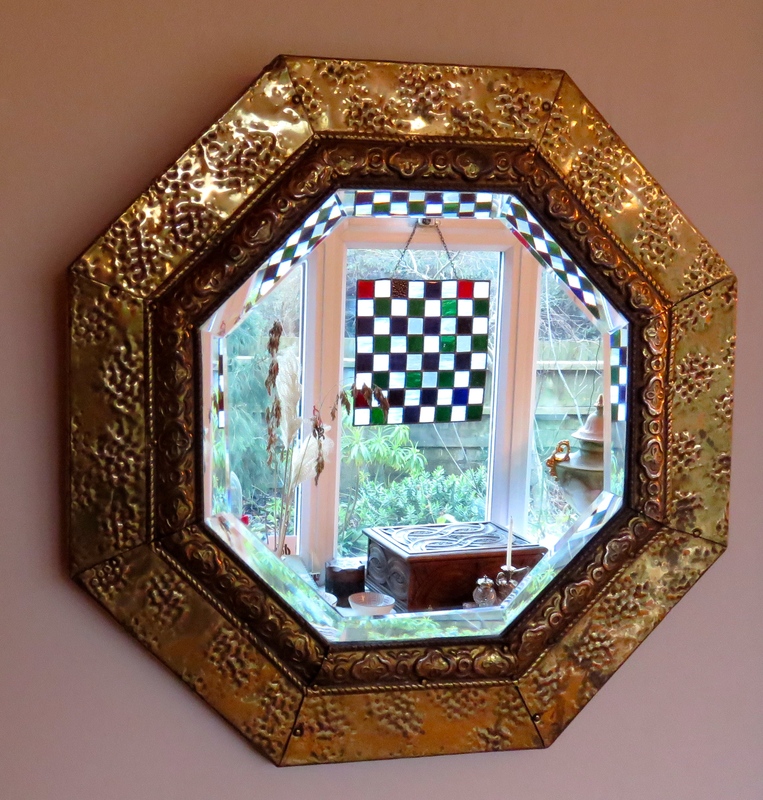 We then moved on to Molly’s Den in search of a chair, and instead came away with a rather attractive bevelled mirror which we think is probably contemporary with our house. A rack of pork ribs in barbecue sauce provided our evening sustenance. This was accompanied by Jackie’s savoury rice, this time including and enough finely diced vegetables as to suggest it was an exquisite biriani, and crisp red cabbage stir fry. Jackie drank Peroni, whilst I chose Lidl’s 2012 Bordeaux Superieur. After a little more packing this morning we drove over to Shelly and Ron’s in Walkford to unload some of it for storage in their home before we move. Just around the corner from Jackie’s sister and brother-in-law, the ashes of her much-loved mother lie buried in Woodland Burial Ground. The Walkford site is one of many ever more popular resting places for the remains of loved ones. Here people’s bodies are interred; or their ashes are either buried or scattered. Careful records are kept for posterity. 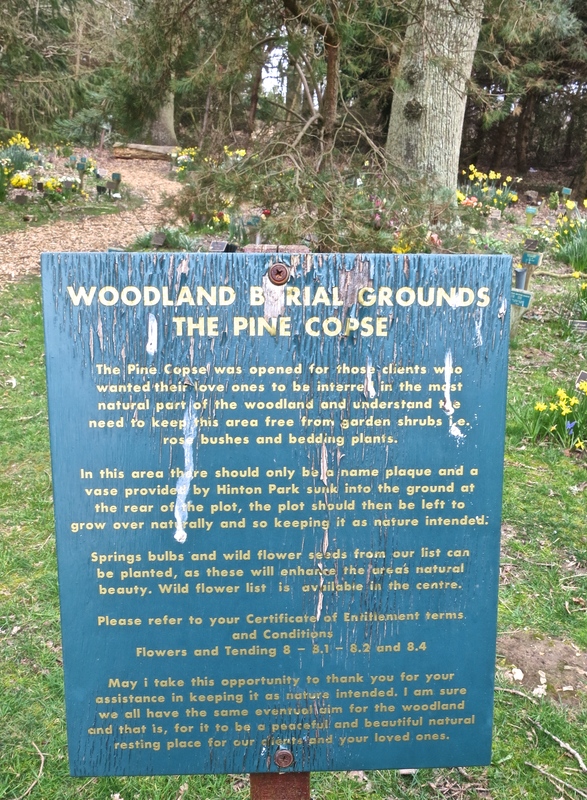 The regulations are such that nothing more than the small identification plates are put in place at the time of burial, and no flowers other than those expected to be found naturally in woodlands are to be planted to mark the spot. Bodies are buried in open spaces, and indigenous trees are planted by the plates. The ash burials are in already established copses. 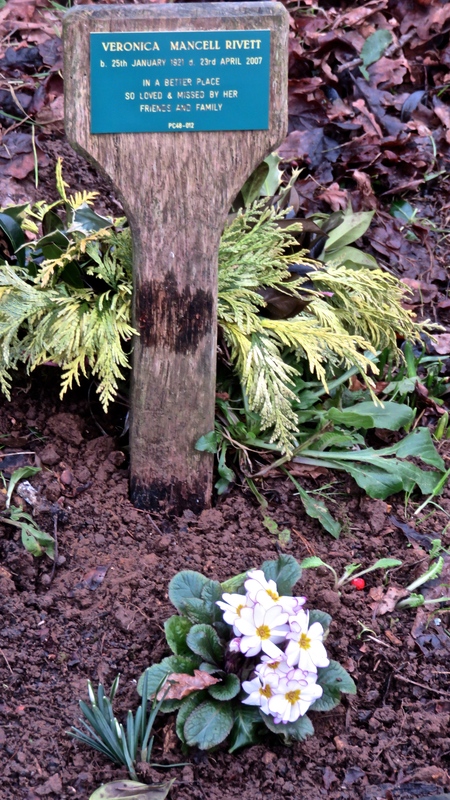 Mourners may set woodland flowers around those areas. Cultivated roses will be removed, although cultivated daffodils seem to be acceptable. 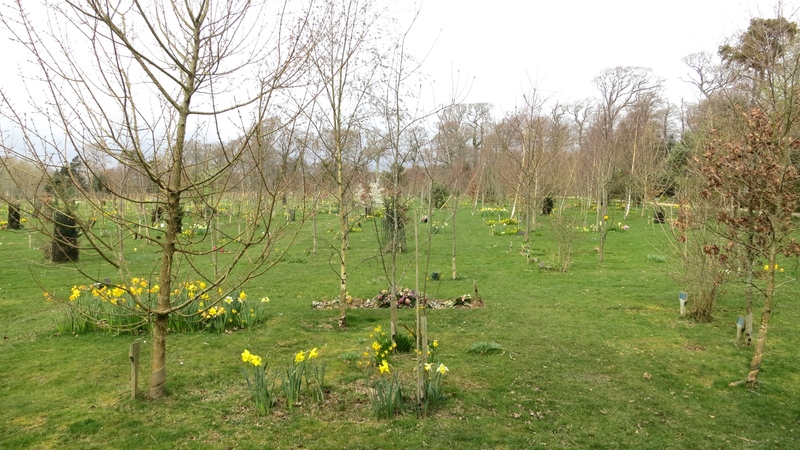 The idea is that the whole plantation eventually reverts to natural woodland. 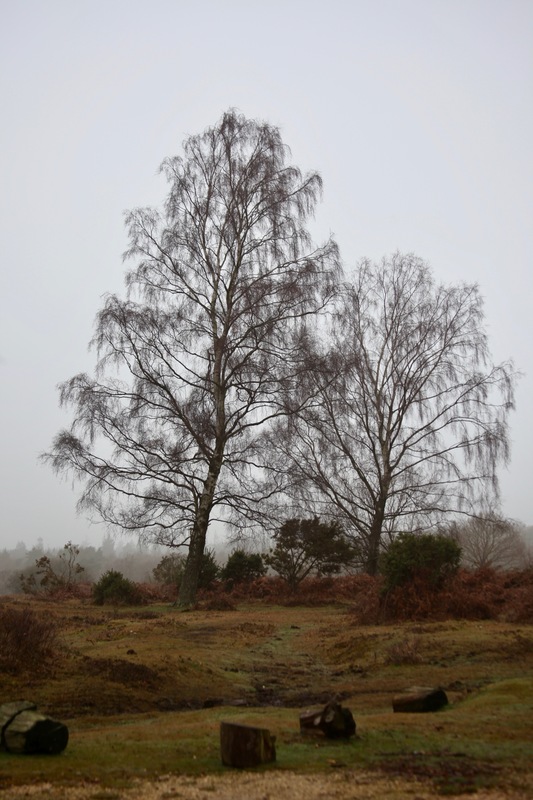 The remains of Veronica Mancell Rivett lie beneath rich soil in the Pine Copse. Although bird droppings may be considered to keep the explanatory notice ‘as nature intended’, Jackie cleaned them off her mother’s marker. As she tenderly stroked the daffodils she had, along with the primroses soon to bloom, herself planted, her mother’s ring was displayed. This opal ring, which Jackie always wears, was first worn on our wedding day in 1968. There was a funeral going on when we arrived, so we had to park at the far end of the designated area. 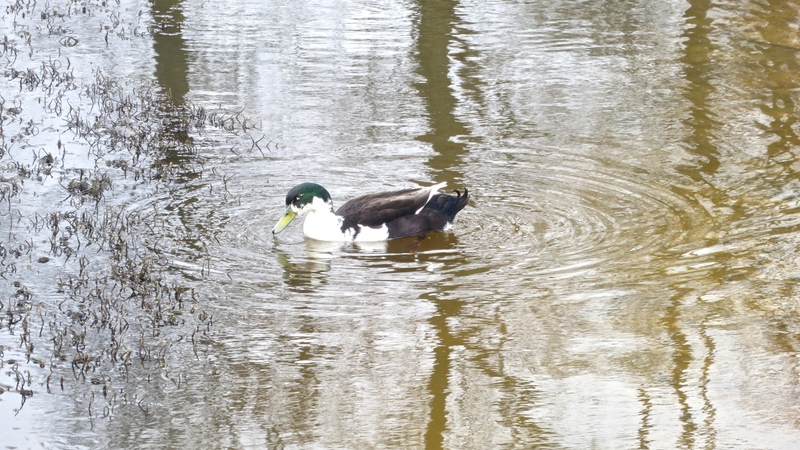 This alerted me to the presence of a lake of which I had been previously unaware, where muscovy drake enjoyed the company of a number of mallards. It is now three full working days since Penyards Winchester office manager undertook to investigate the recorded phone conversations I had had with his staff, and get back to me. I have heard no more from him. This morning I posted at first class rate a letter to him repeating the details of the saga, stating that we regarded our tenancy as ending on 1st April, and that I had cancelled the standing order for rent payment with effect from 31st. March. By the same post I wrote to my bank instructing the cancellation. This evening I e-mailed a copy of the Penyards letter to the addressee. We dined on superb sausage casserole (recipe), mashed potato, carrots and green beans. And jolly good it was too. I drank Valle del Rapel Chilean Merlot 2012. On 25th December there cannot be many homes in this country without a television turned on at some time in the day, perhaps to watch The Snowman, The Shawshank Redemption, or The Queen’s Speech. It is incidentally amazing that the same queen, Elizabeth II, who had already been on the throne for ten years in December 1963 will again make the speech this year as she has done annually ever since. My sister Elizabeth was so entranced when I took today’s advent picture that I doubt it was her royal namesake she was watching. 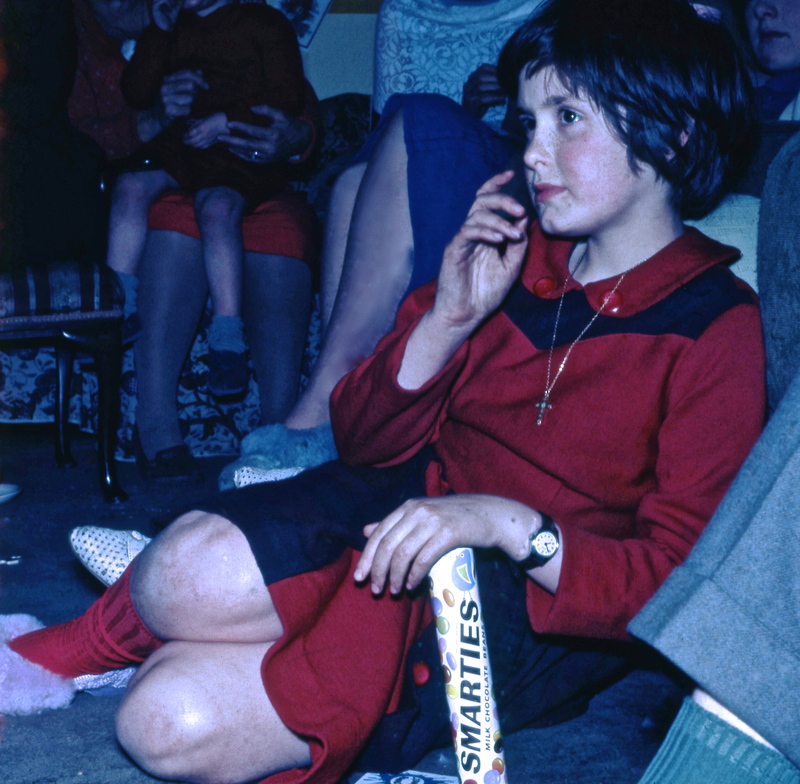 The little girl must have found the smarties in her stocking. She is flanked by Vivien and Grandpa Hunter, whilst Joseph, from whom she may be protecting her spoils, is perched on Grandma’s lap. 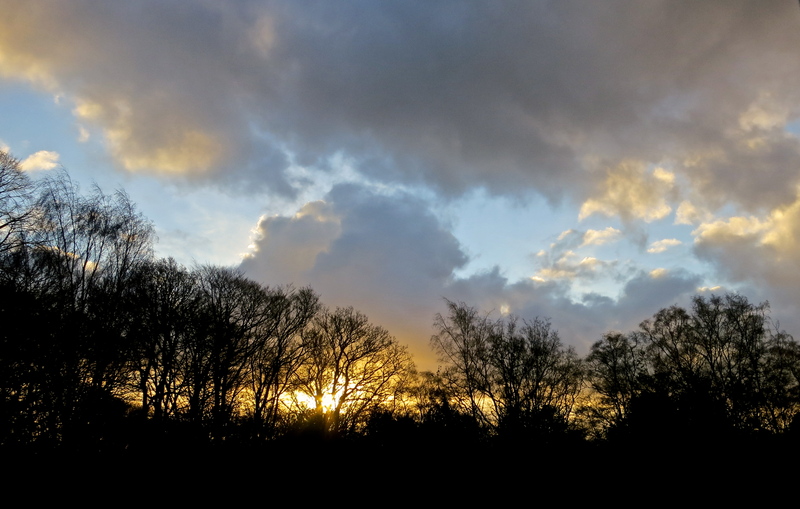 The rising sun this morning, peering through the now naked trees and picking up the edges of the fast-moving clouds with a promise of rain, offered us a stunning, albeit transient, view from our vast living room windows. By the time we had made an early departure for the Woodland Burial Ground at Walkford, the heavy wet slate clouds dominated the sky. At the burial site we met Helen and Shelly for the three sisters’ annual laying of a Christmas wreath on the small plot that contains the ashes of my delightful former mother-in-law Veronica Rivett. A few tears were shed and reminiscences were shared. Mum, who had enjoyed celebrating Christmas well into her eighties, would have appreciated the timing of this tribute. What particularly came back to me was how she had dropped everything and crossed London to collect and look after Matthew on the morning in 1969 that Jackie was hospitalised with meningitis. This was the day I was due to begin my Social Work training course at Croydon Colleges. Jackie had been ill for a fortnight and her head was so bad that morning that we called the GP who, within seconds, diagnosed meningitis and arranged for hospital admission. This meant care had to be arranged for Michael, then five and at school, and Matthew, at nine months old. A neighbour with a son at the school took on the task of transporting Michael to and from school. What I had forgotten was that Matthew himself had German measles at the time and that his Nan took him to her bed; and when Jackie was back home but still unwell, Helen and Bill came to stay with us for a short while to continue the care. We repaired to Shelly’s nearby home for coffee, conversation, and home-made mince pies. After this Jackie and I drove to New Milton to buy some specialist Asian supplies from a shop which will hopefully become a local resource. The shopkeeper recommended a Sri Lankan restaurant in Bournemouth. This afternoon I finished reading Voltaire’s short story ‘Le Monde comme il va’, in which a messenger is sent from the deities to report on the behaviour of the people of a mythical region. Babouc’s observations are to determine whether or not the allegorical Paris warrants annihilation on account of the baseness of its population. The reporter finds that there are also positive qualities to be found in humanity and recommends continuing existence. The world as it is is worth keeping. Perhaps I am beginning to get the hang of the philosophical journey. The restaurant mentioned earlier was the Dosa World in Old Christchurch Road. With fond memories of Morden’s Watch Me, we just had to visit the new one this evening. This turned out to be quite an experience. This morning’s clouds fulfilled their promise, and the wind that had sped them on their way continued most forcefully. From late afternoon until after we returned home we were treated to a tempestuous deluge. This made the journey, peering through a windscreen regularly obliterated by rain and wipers, rather precarious. A hold-up on the A35 was caused by a fallen tree. We spared a thought for the police personnel attempting traffic control in gale force wind and rain. Because Jackie had researched our destination well on google maps we were able to negotiate old Bournemouth reasonably straightforwardly. The wind was such as to send cyclists wobbling, to attempt to uproot shrubbery on the roundabouts, and to blow umbrellas inside out. More problematic, it was able to tear the passenger door out of my hand, doing enough damage to the hinges to render it impossible to close the door without lifting it. This meant that when we came to return home, because I couldn’t manage successfully to do this from inside, Jackie had to get out in the pouring rain and do it from the outside. My turn to struggle in the rain had come earlier when I tried to coax a ticket out of the parking meter that had snaffled my pound but had no intention of releasing what I had paid for. Eventually I decided they’d had my money and if necessary I was prepared to say so in court. Anyway, it was unlikely that any sane traffic warden would venture out in this weather. None, in fact, did. Whilst we dined in the restaurant we watched people rushing by in a vain attempt to keep dry, and the glass door kept blowing open. When we left, the street was strewn with dead umbrellas. 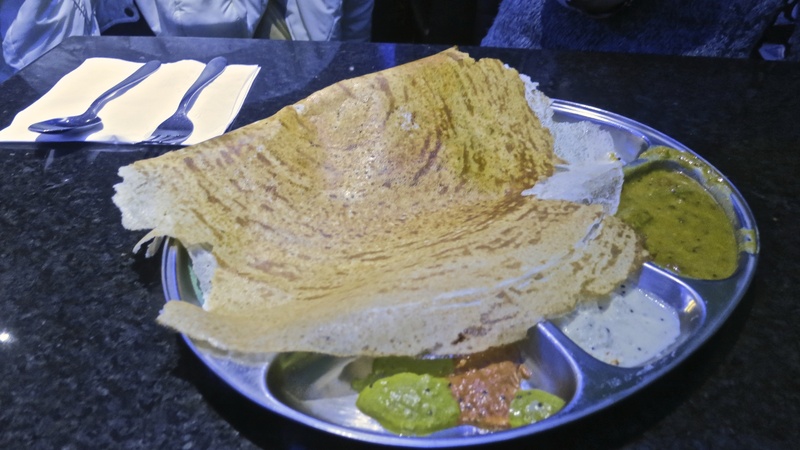 It was not up to the standard of the Watch me, but the Dosa World was worth the trip, although we may not think so when we have the bill for the door repair. 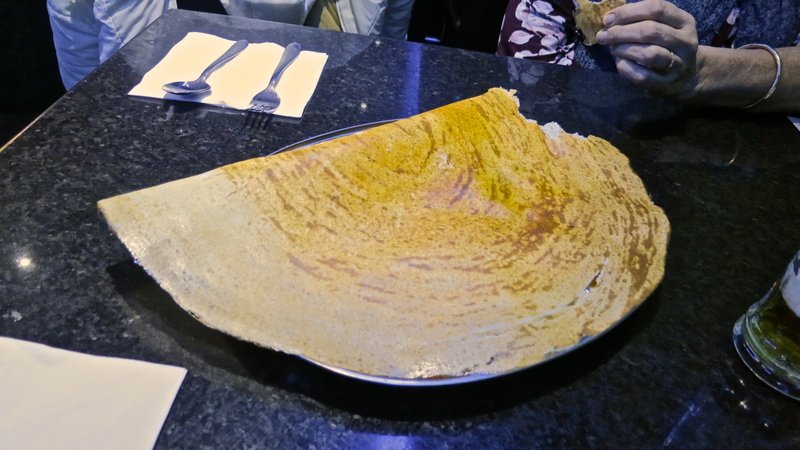 The Dosa itself was a good indication of the very good meal to follow. This filled crepe was so large that it buried the sauces beneath it. We both drank Kingfisher. The young man who served us was personable, attentive, and helpful. Possibly because they only deal in cash, the prices were really rather low. On our return journey, all last year’s familiar pools were back. The water wrenched Jackie’s steering, and my woollen overcoat smelt like a wet sheep. This morning I walked down through Minstead some way past The Trusty Servant until, finding the road impassable without wellies, I turned back. Driving through this particular pool later confirmed that my decision had been sound. I described yesterday as a respite from the deluge. It was a very brief one. Relentless rain that had started up again in the night persisted during the day. 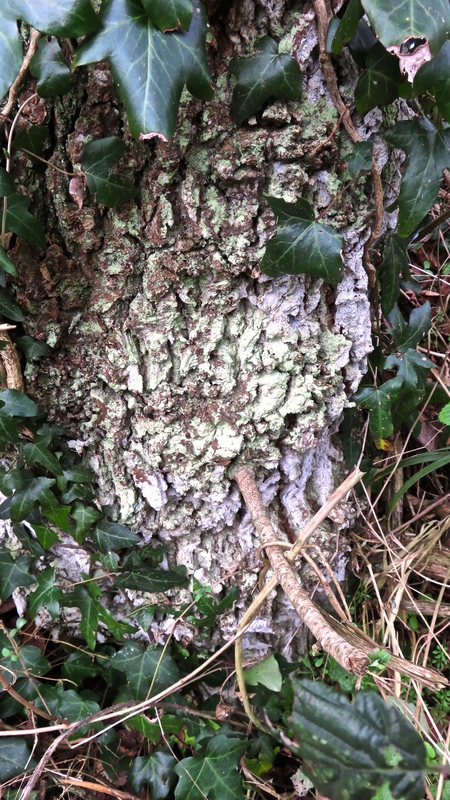 Moss and lichen thrive in these conditions. I waded the streams, supplied by swollen ditches, that were our village lanes. Drains were blocked and new pools had appeared. Never mind, much of the mud was now washed off my walking shoes. No animals were abroad. Even Primrose and Champion’s field was empty. I do hope they had been removed to somewhere warm and dry. I saw no birds. When we drove through the village this afternoon we had to negotiate the rear ends of seven cows with their noses in buried in hedges. The Mobile Library was bravely and optimistically stationed opposite The Trusty Servant. The Local Authority Library Services are some of those facilities much reduced by economies since the recession, so it is good to see one still available in such a remote area. On my return I met Dave on his way for his newspaper. We stood in a pool and chatted for a while. We couldn’t get any wetter. That is, provided we continued successfully to leap like schoolgirls over a swirling skipping rope, every time a car went by. The tsunamis they threw up had me reflecting on Hokusai’s great wave painting. Jackie then drove us to Shelly and Ron’s where, together with Helen and Bill, we were given a plentiful salad lunch before I went with the three sisters to Walkford’s waterlogged Woodland Burial Ground to place a Christmas wreath over the interred cremated remains of Veronica Rivett, Jackie’s much-loved mother and my lovely ex-mother-in-law. 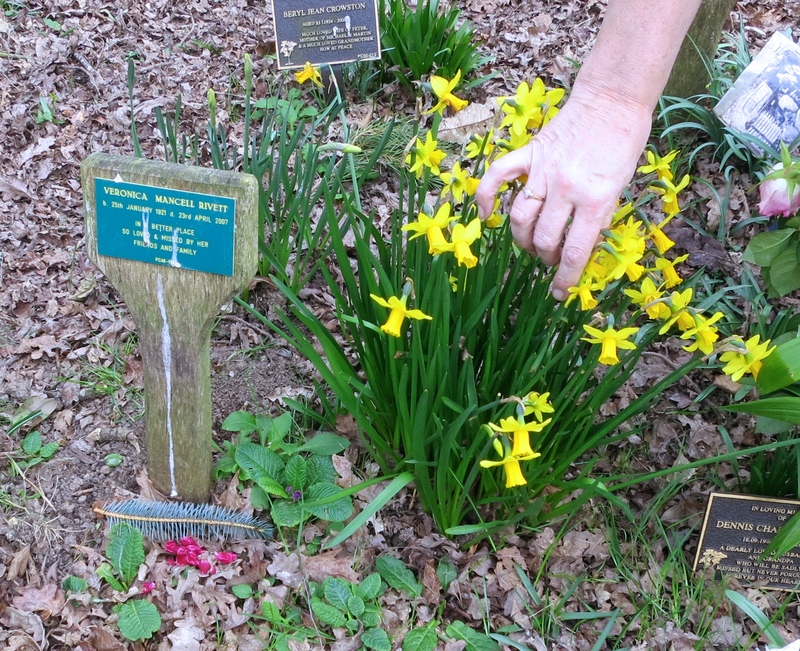 Woodland burial grounds are places where people are laid to rest in natural surroundings. Here there were some graves, but generally the much smaller plots contain ashes marked with a simple low-level labelled post. Natural wild flowers are allowed to be seeded and to grow over these areas. In other sections than this one people may also plant trees. At the entrance to the site a row of silver birches stands in a new pool where, as we were leaving, Wellington-booted children spuddled about, disturbing the ducks which had been enjoying a change of scenery from their lake. Afterwards we settled with coffee and mince pies to watch Ron’s holiday videos until it was time for Jackie and me to leave for the Chichester Cathedral Carol Service. On the A35 we encountered the first flood warning sign either of us had seen actually alerting drivers to a real flood. This caused a bit of a hold-up. After a brief return home Jackie drove us through swirling rain to Chichester. Fortunately we arrived in the town half an hour early. This was lucky because it took us twenty minutes driving around trying to find a way into West Street where we were to park in the Prebendal School staff car park. When we did manage that we couldn’t find the car park. The entrance to this, in darkness, was tucked between two tall buildings. Jackie waited in the car in the street while I went hunting for it on foot. This was conducted whilst on the phone to Ian seeking confirmation that we were in the right place. He, Becky, and Flo, who were caught in traffic, did not arrive until exactly the start of the service, when we were esconced right at the front of the Presbytery. We didn’t see each other until afterwards. It was a privilege to have been invited to listen to such a beautiful choir in such a splendid historic setting. When the service was over we all ate at The Old Cottage, a surprising name for an Indian restaurant. The food was excellent and three of us drank draft Cobra. Becky had diet coke and Flo drank apple juice. We had a very enjoyable time, after which Jackie drove us home in 42 minutes. Since Becky’s family will be moving to Chichester eventually, this was a rather encouraging journey for the future.